Foreign Exchange is very lucrative & profitable in modern Banking business. Its recognized as a way of generating maximum profit with low investment. In other Banking like advance needs high capital investment. But foreign exchange required comparatively low investment. In foreign business complexity is high due to rapid change in technology especially for a bank consists of so many branches dispersed in a wide region. The system is easy for a bank to control rich in capital equipped with modern technology concentrated in a small areas. Technology is necessary to prepare quick statement, getting information, preparing reports .Now technology is a turbulent in foreign exchange business. To survive in the competition a bank has to adapt with this changes. For this it will require skilled manpower, on line banking, 24- hours banking services, high capital investment. Problems arise in foreign exchange for changes in economical, and political business environmental changes of the country. Changes in exchanges rate, change in currency rate, govt. rules and regulations, create problems while dealing in foreign business. So it needs always a conscious mind for successfully dealing in foreign business. For opening an L/C there must be a relationship between banker and customer through opening an account with the bank. b) In case of individual must submit all types of income tax payment certificate. This account also gives benefit to the account holder. Generally business organization or limited company cannot open this account. Savings Account is opened by those person/people, who are interested to collect money from his account every now and then as well as want to get interest on deposited amount. No one can collect money from his/her account more than two times per week. Generally week is denoted from Saturday to Sunday. Inter is given to this account. But if the given interest of six months is less then TK. 10 will not be added in the account. At least TK. 1000 has to be kept as balance by the depositor. Interest is counted two times meaning after six months after. Character certificate by the chairman/commissioner certificate/photocopy of the passport (only first four pages). Personal information of the organization (if opened with minor). Details information of the organization (if needed). Signature in the account opening from/card must be same with the signature of the passport. The interest rate of Savings Account is 6.5% annually. But this it is calculated two times per year. 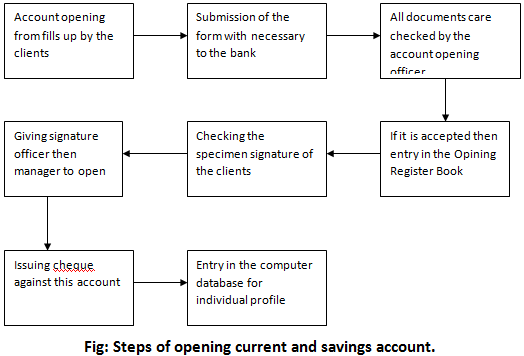 Fig: Steps of opening current and savings account. b) Then have to use to reference that have existing relationship with the bank or all ready maintain accounts with the bank. c) Two copies resent attest p.p. photograph. d) Put three-specimen signature on the signature cards. e) Write in details amount of deposits and nominee person address relation with account holders who will hold the account in the absence of clients. f) Enclosed memorandum of associations and articles of associations along with form. The FDR account is an important account. The interest rate of this account is higher then other account but it depends on the period of time. The more you hold your money in the bank, the more you get as interest. So many people keep their money as FDR basis in the bank. The UBL also invites a lucrative fixed profit for account holders who are more interested to open these types of account. Any Bangladeshi national residing home or abroad may open FDR with UBL. FDR may be opened single/joint name for a period of 3, 6, 12 and 36 months. UBL offers attractive/competitive rate of interest in FDR. If any account holder wants to receive money from his account without the covering of maturity he must not be paid any interest by the bank. But it is said that if any account cross the three (3) months he must paid on three months interest. This account is also an important for many organizations. This account requires a large amount. Generally there is no basis difference between the Current Account and the STD Account. The only main difference is that STD A/C provides interest but Current A/C does not do it. Govt., Semi-Govt., Autonomous organization and an individual may open STD Account with UBL. UBL offers attractive/competitive rate of interest in STD accounting. After opening this account cheque is issued. Account holder can withdraw money from his/their account at any time. 7 days notice required to withdraw big amount. It requires (For Individuals): 1. name 2. Father’s Name 3. Present & permanent address 4. Date of birth & age 5. TIN no. (If available) 6. Phone no (If available) 7. Photocopy of the passport (first four pages)/Word Commissioner Certificated/Character Certificate of the Union Perished Chairman. It requires (For Limited Company): 1. Certificate of Incorporation 2. Articles of Association 3. Memorandum of Association 4. Decision of the Board Meeting 5. Director’s Message and the necessary information of the account conductor. It requires 9Club and Other Organization): 1. Office Employees Description 2. By-Laws 3. Government Authorization Letter (if registered) 4. Certificate of Registration 5. Introduction of the Members of the governing Body or Managing Committee etc. The interest rate of STD account is five and half percent (5.5 %.) per year. Actually cash maintenance is vital portion of a bank. Because it is the risky deed one. All the employees should understand the activities of cash department to make self development to be a complete banker. But it is common to all branches that maximum employees are far from the cash function to avoid the risk. Generally, Assistant manager is the main responsible person to handle the remittance function. No one can go out of the Bank until and unless cash is sent to the volt. Receiving cash from the depositors. Payments of cash to the client as demanded. Checking all areas of deposit slip whether it is clearly written or not (name, account no. amount). Verifying the payment cheque when to pay the money to the clients whether the information is available or not like date, amount, account number etc. All the received and payment money must be written down in the receipt & payment register along with account number. Cash register must be maintained by the Cash Officer. Maintenance of daily cash balance. L/C must be open through current account. L/C dealing officer have to properly check the Proforma invoice –description of goods along with its price, quantity, quality, sources of export country, marketability of goods, shipment dates, shipping days, bill of entry. Packing list, certificate of origin, H.S. code no. Brand new. Certificate of taxpayers from tax commissioner. Trade License from city commissioner. Certificate from import and export registration department. Money receipt from insurance company to reduce risk export port to import destination. L/C Authorization form of the bank contains IRC number, shipping period, description of goods date of l./c issues. – 1 copy for Bangladesh banks. With name and address of dealer remittance, l./c form, description of goods, inventor name, price for exchange clearance. 1- copy for custom purpose, another copy for office record. When the importer is not well known. The exporter selling on credit may wish to have the promise of payment. When the importer doesn’t want to pay the exporter until it is reasonable certain that the merchandise has been shipped in good condition.